DARPHIN 8-FLOWER NECTAR 15ml is a rejuvenating facial serum which blends the radiance boosting essences of 8 precious flowers, into on treatment. DARPHIN 8-FLOWER NECTAR purifies and rebalances your skin overnight so that wrinkles and lines are smoothed, your skin feels plumper and your complexion looks revitalised and more radiant. With a decadent floral scent, this aromatic essence of essential oils addresses all the visible signs of ageing, nourishing your skin and boosting its natural radiance so that your skin looks smoother and more youthful. Active Ingredients: Jojoba Seed Oil, Sunflower Seed Oil, Avocado Oil, Apricot Kernel Oil, Macadamia Seed Oil, Jasmine Flower Extract, Iris Essential Oil, Orange Flower Oil. Treatment Type: Lifting & Firming Nighttime Facial Serum. 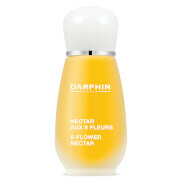 DARPHIN 8-FLOWER NECTAR 15ml was found on 2 websites and was price compared using EAN: 0882381030483. The cheapest DARPHIN 8-FLOWER NECTAR 15ml is shown as the main item, prices range from £98.00 to £98.00, excluding delivery. Price comparison based on price and delivery charges, with any valid discount codes being applied, is shown in the table above. Prices and information correct at the time of publication.